Thanksgiving in...Singapore? - Blog from Windsor Park Estate, Singapore | Where in the world is Celia? If someone told me 6 months ago, I'd be spending Thanksgiving - the biggest American holiday - in Singapore, I'd have said you were crazy. Yet here I am in Singapore on Thanksgving day. My flight from Dubai to Singapore was less of a wonderment than my JFK to Dubai flight. The plane was the usual large aircraft used for international flights with only one level. However, the service on this final 7 hour leg was just as impeccable. The plane was actually on its way to Brisbane, Australia but would make a stopover in Singapore first. My first seatmates were an overweight indian couple who seemed repulsed at the prospect of spending over 7 hours sitting next to each other and sat with a seat between them. Unfortunately for them my seat was the window seat and I had to decline the wife's imploring eyes and request that I sit in the middle seat. So I squeezed over to my window seat and after the husband had a few words with the flight attendant, it seemed an open row became available and they quickly scurried somewhere in the back of plane. Yes! an entire row to myself for this 7 hour flight. I can stretch out and oh I have 3 blankets to cover up and...to my dismay 2 tall and overweight men asked if they could sit in the seats. They were executives for an accounting firm and had not seen each other for some time and thought sitting next to me would be a great time and place to catch up. They turned out to be terrific seatmates, so being squished was less exasperating. Omar was of pakistani roots raised and still lives in England and Jamal was his director and lived in Dubai. Omar told me his life story of his 2 wives and divorce and how happy he'd been these 19 years with his second choice. He then questioned if I was on my way to Singapore to see a boyfriend and then proceeded to give his view on marriage and dating and even offered to hook me up with his boss Jamal. I smiled at Jamal and thanked Omar for his good intentions and explained that I had already committed myself to someone else. Omar smiled at me and said, "Well I hope that man knows how lucky he is because I can tell that you are a good person and I'm glad to have met you." I look out the window and see greens and blues and pockets of developed areas. I'm not sure what I'm looking at. Perhaps it is Malaysia I'm looking at, but I'm not sure. Then the plane lands and I'm in south east Asia! And it is Thanksgiving day. I disembark the plane and the airport is moderately filled with people who are relaxed in their step and don't seem to be in a hurry anywhere. There are even chairs with leg massagers in the waiting area and people are enjoying them. The airport reminds me of an island airport like Puerto Rico's Luis Munoz Marin airport. On my way to immigration, I see a bank of computers with free internet access and quickly send an email to my loved ones that I have arrived safely. I wait in the immigration line and the customs officer just stamps my passport and off I go. Not even a "what is the purpose of my trip?" question. I proceed to the baggage claim area, collect my luggage and go over to the taxi line that is located indoors. A lady directs me to a waiting taxi outside and as instructed, I ask him to take me to the UE Square Taxi stand. The roads are clean and paved. Surprisingly everyone drives peacefully and at a moderate pace. I did not hear one single horn the whole ride and the streets were eriely quiet although filled with cars. So for all my anxiety about traveling to the far east and I find...it's no different than what I had been accustomed. In fact when I saw the cars driving on the left and the palm trees on the side of the road, as an island girl, I felt very at home. Upon my arrival to Singapore my friends thoughtfully booked me for a 1 hour massage with Lillian at Healing Hands. I know that woman's whole body was on my back and I don't know what she was doing, but I felt very good at the end. Later that evening, I met up with my friends, who are all Americans and we decided to have Thanksgiving dinner at a Thai restaurant called Jim Thompsons. All the american restaurants were fully booked so we had no choice but to choose somewhere else. My thanksgiving dinner consisted of chicken pad thai and mango sticky rice for dessert. We all sampled each others dishes. So I had some green curry, a crab dish and an array of other items I wasnt quite sure what they were but ate it all like the hungry belly aka "wanga gut", all who know me to be. We all said what we were thankful for and toasted each other with tropical breezes and thai absolut drinks. 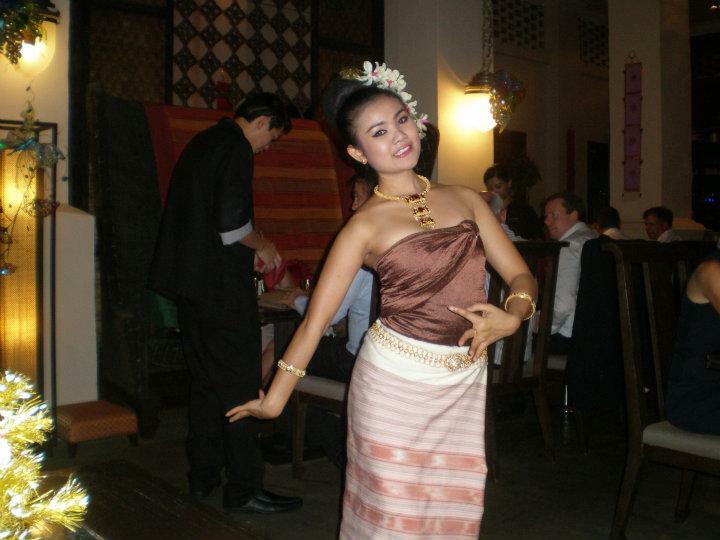 All the while we dined a thai dancer did a traditional slow moving dance between the tables. She is the one pictured with this blog. It wasn't the typical Thanksgiving neither by country or cuisine, but it was a good Thanksgiving nontheless spent with good friends and that is what is most important. And thus ended my long travels from the USA all the way to Singapore. When it was time to sleep, you can better believe I fell into a deep sleep and did not awaken for another 10 hours.